Many cell adhesion molecules were shown to functionally affect synapses. These include homophilic cell adhesion molecules such as cadherins or NCAM, and heterophilic cell adhesion molecules such as neurexins/neuroligins and Ephrins/Eph receptors. For none of these cell adhesion molecules an unequivocal role has been demonstrated. This deficiency is probably partly due to the fact that demonstrating such a role is difficult, but may also be caused by an intrinsic functional ambiguity of such cell adhesion molecules. Specifically, many synaptic cell adhesion molecules do not only have a function at the synapse, but also in other developmental processes. Moreover, many synaptic cell adhesion molecules may be part of an ensemble of cell adhesion molecules that together determines the overall process of synapse formation and maintenance. In principle, synaptic cell adhesion molecules could potentially be important for the initial formation of synapses, for their mechanical stabilization, and for trans-synaptic signaling that mediates, among others, specification of synaptic properties. An intriguing assay to probe for a role in initial synapse formation was described by Serafini and colleagues16. In this assay, non-neuronal cells expressing a candidate synaptic cell adhesion molecule were co-cultured with neurons, and the formation of synapses by the neuron on the non-neuronal cell was examined. These experiments revealed that neuroligins were potent inducers of artificial synapse formation16,17, presumably by binding to neurexins. In the same assay, another unrelated synaptic cell adhesion molecule, SynCAM, was active, whereas many other proteins were not18. However, several observations suggest that this assay is unlikely to directly report on synapse formation, and more likely monitors the general process of trans-synaptic signaling. First, it is unlikely that initial synapse formation is mediated by multiple very different molecules. Second, in transfected neurons these same molecules had very different effects (e.g., see ref. 19). Third, these molecules are expressed by all neurons; it is hard to imagine how specificity of synapse formation would be generated if all neurons were triggered by these molecules to form synapses. 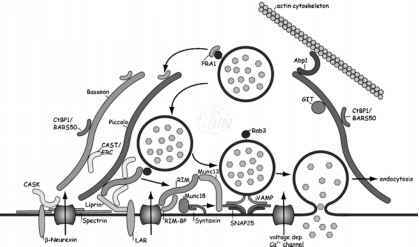 A more likely interpretation is that the assay simply reflects activation of a trans-synaptic signaling cascade, and that activation of such a cascade is sufficient to stabilize a transient synaptic contact. Synaptic cell adhesion molecules perform a minimum of four roles: 1. a function in the initial establishment of a synaptic contact; 2. a function in mechanical cohesion of synaptic contacts, thereby aligning pre- and postsynaptic specializations with each other; 3. a function in specifying the synaptic properties of a synaptic contact (e.g., the target-induced differences in presynaptic release properties of L2/3 cortical neurons, which could be referred to as stable trans-synaptic signaling; see Figure 0.2), and 4. a function in transient trans-synaptic signaling events. Assaying for these functions is difficult because both in vitro and in vivo assays have limitations, and because many synaptic cell adhesion molecules likely perform multiple functions. Nevertheless, given the apparent promiscuity of initial synapse formation, it seems likely that the majority of synaptic cell adhesion molecules will be more involved in role #2-4, and that these roles are more important for synaptic circuit formation than the initial formation of synapses.